The Boulevard Market has over 180 types of hand-cut cheese at any given time. From timeless classics like Gruyere to small-production, up-and-coming cheeses like Cypress Grove's Humboldt Fog, we carry a constantly changing stock of cheese to meet your needs. Since our selection is always changing, we cannot offer a full product list online, but email us at Erika@BoulevardMarket.com or call 517.423.6000 if you're looking for anything in particular and we would be happy to assist you! Characteristics: Distinctly milky flavor, no aging, soft. Fresh chevre (goat cheese) would be a popular example. Characteristics: A soft, furry coating surround 3 sides of the cheese paste. Brie would be an example of Bloomy Rind cheeses. Characteristics: A slightly tacky, orange colored rind with a distinct odoriferous quality. Limburger would be the best known example of washed rind cheeses. Characteristics: A hard firm rind with the paste of the cheese being semi soft and creamy. 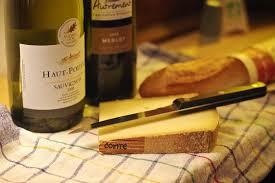 Tomme de Savoie or young Italian Pecorino would be good examples of semi soft cheeses. Characteristics: A hard rind and firm paste. Possible holes or gritty bits may be present in the paste. Characteristics: A semi soft cheese obviously veined with blue. Blue cheese can be rindless or have an inedible aged rind.